I’ve been getting a significant number of inquiries for the power version of my Gato Especial sailing cat. I let it slip out, some time back, that there would be an engine driven version coming along, but time got away from me and so, the project sat idling on the design table. I’m kind of drawn to cars and boats that can solve a host of utility needs, as well as provide a comfortable, transportation experience. I’m about to sell my venerable Toyota Landcruiser and get myself into something that makes a lot more sense when it comes to utility and fuel efficiency. As a result, I began to think of a motorized version of the Gato platform as a Crossover/SUV type of vehicle with a big interior volume aft of the helm station and truly fuel-efficient engines to complete the picture. 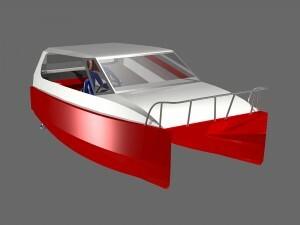 The new boat would have a stand-up position for the driver with a sliding, deck-mounted seat that would allow the skipper to sit while steering. There would be a huge deck surface behind the helm for all sorts of seating and/or gear carrying options. The new boat would have a tailgate/liftgate setup for ease of loading. The new design would have a big storage space forward of the helm for the odds and ends that always end-up on a boat. 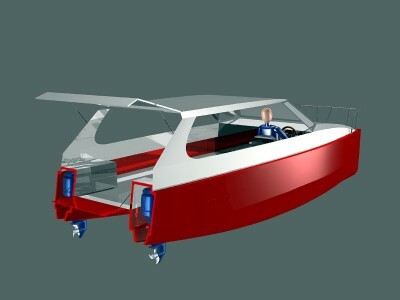 Power for the initial design would be from a pair of four stroke outboard engines for redundancy, as well as beneficial weight distribution. On a personal level, I am attracted to design concepts that deliver a responsible set of solutions for this new economic reality in which we all live. I like the term, Crossover, which is openly lifted from the automotive industry, as it touches on the realities we will all face in the coming years. We are headed to a time in which our vehicles will need to do more than just give us a sedan in which to cruise around, or a truck to do our dirty jobs. In the world of cars, the Crossover approach has created vehicles that live in the niche right between the heavier, clunkier, SUV’s and the typical, everyday passenger car. Similarly, with this new design, I was looking to take the slot right between the generously proportioned sport cruisers you see at marinas all over the world and something like a cleanly drawn work boat. I wanted some of the people driven touches of scale and fit/finish, while being able to morph from one working task to another as a truly useful, all-around watercraft. The result would be my take on what a boat should look like which is much more fuel-efficient and less expensive to build and transport. It would provide a very high degree of utility and, of course, it would need to be wrapped in an aesthetically pleasing package. 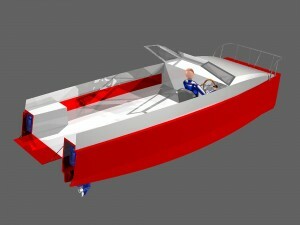 The aesthetic, design component is pretty much a subjective thing, but the fuel-efficient aspects are a design process that combines easily driven lightweight hulls, drive systems with high economy for delivered horsepower and a significantly reduced aero drag signature allowing the boat to just slip through the air. I’m of the opinion that I have reached all the basic design criteria with this new design, The Largo. Yeah, sure there’s a distinct connection to the Bond films, Thunderball and Never Say Never Again, with the bad guys both being named Largo. Beyond that, Largo is also a direct take on the ’48 Film Noir thriller with Bogey, Bacall and Edward G. Robinson. It is also, the well-known island in the Florida Keys where boating adventures await in every direction and one of my favorite adventure boating events, The Watertribe Everglades Challenge maintains its finish line. The aft cabin space of the trimmed-down version will have the potential for a huge, manual, slide-back sunroof for a full open-air effect in the main cabin volume, as well as large side openings for breeze and visibility. The side openings can be fitted with removable, semi-structural soft windows for better streamlining and also for inclement weather. Way back at the aft end, the boat has a floor level, drop-down tailgate, as well as a glassed, liftgate. I see this as a utility benefit when the boat is beached, bow out, in a marina slip. 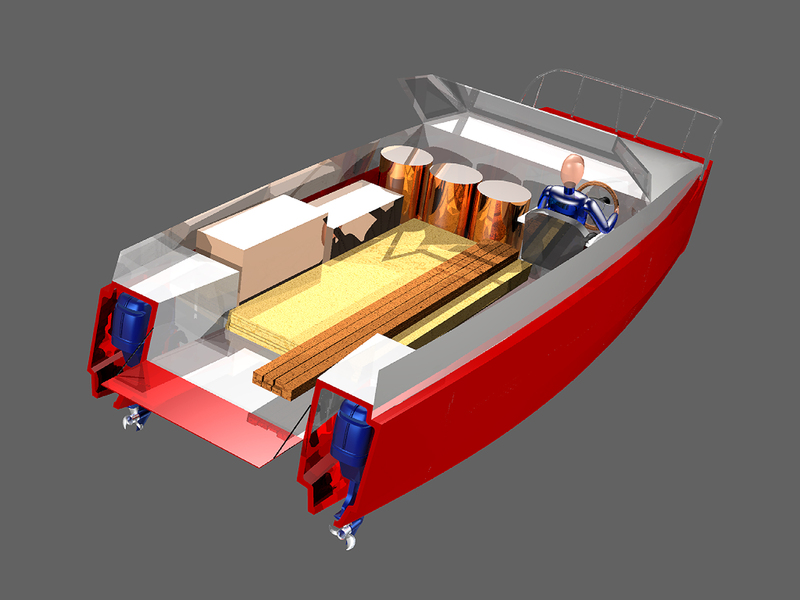 The tailgate will allow easy loading of gear and anything else that might be shoved in the back of this boat while it is still on the trailer. It will also give a chance to sit on the tailgate and hang out. The entire hardtop can also be removed for a full-on waterborne convertible. Or, if you like, a pick-up truck for the waterfront that can haul a whole bunch of oddly shaped objects, should you have a need for that kind of utility with friends while enjoying a sandwich or cold beverage. The suggested engine package is based on need. If the owner wants to cruise with high efficiency and still be able to bang out 11-12 knots when he likes, then a pair of Yamaha Hi-Thrust 9.9 hp engines will do the trick. The engine setup can be equipped with remote starting, steering and power engine tilt. They both have pretty healthy alternators to keep any onboard electrics going, so lighting, navigation and radio systems can be easily powered-up. Cutting edge enthusiasts will ditch the outboards and equip the boat with a bank of batteries under the deck in each hull and a pair of powerful electric motors that drive a set of matched, counter-rotating props. As an alternative to the twin outboards, this boat, so equipped, will silently cruise with a pretty decent range and be able to go to full power instantly whenever the owner wants the buzz of the electric drive potential. The hulls of the Largo are exactly the same as those of the Gato Especial sailing cat. They are 10-1 in Length to Beam ratio at the waterline and will be very easily driven while still providing a respectable displacement payload. The is a spray chine on the inside and outside of each hull to direct wave action away from the boat while underway, as well as reduce drag on the hull. At cruising speed, a small amount of hull lift is also a side benefit of the spray chines. 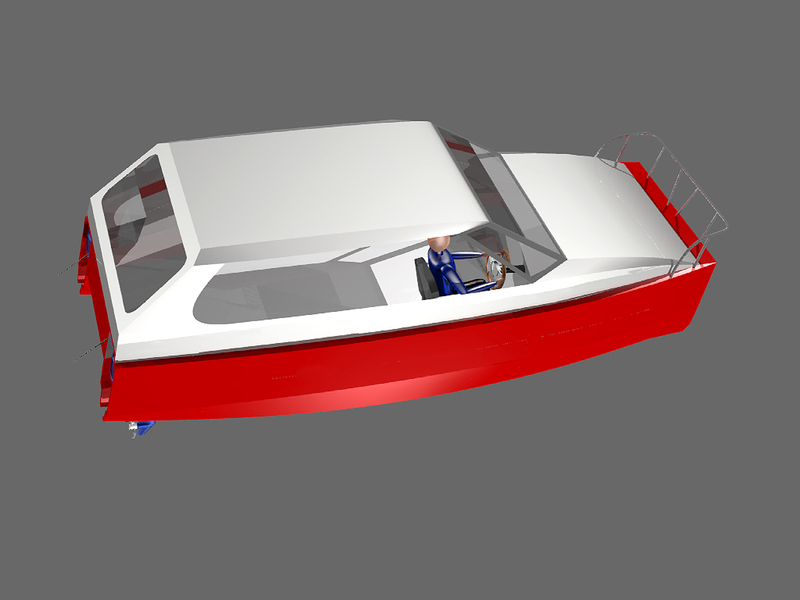 The aft end of the hull bottoms is relieved with a slot to allow engine placement forward of the typical transom mounting and to allow the power tilt capability to raise the props well clear of the hull bottom for beaching and trailer loading/unloading. Moving the engines forward adjusts the balance point of the boat forward and helps with handling and pitching moments. It also puts the engines inside of sound deadening boxes, so the overall noise level is reduced while underway. Cruise the harbor on a warm summer evening with soft music playing on the surround sound system and you can really hear the soft music. Bridgedeck clearance between the hulls is a generous 17″, so wave slap under the main deck will be kept to a minimum. This raises the overall comfort level of the boat, which is especially nice on a longer trip. The large deck space inside the boat will make for a spacious camping environment, gear hauling space, or just about anything else you can think of doing with a boat that is this versatile. The tailgate opens to a generous 49″ width, allowing the owner to load full sheets of plywood right through the back of the boat without leaning them up on edge. The hull volumes below the main deck can also be used for the storage of fuel, batteries, water tanks, anchor, rode, etc. It’s always a good thing to keep the heaviest items on a boat as low as possible to enhance stability and improve ride. The space in front of the main forward bulkhead can be accessed via a large hatch. This is an excellent location for lighter weight storage needs such a sleeping bags, tents, clothing, etc. A good friend asked if the boat could be equipped with a drop-down front ramp and a walk through windscreen so that the Largo could be driven right up onto the beach to unload through the bow. The answer is Yes… certainly can accommodate that feature with a few changes to the forward structure. Clearly, the Largo is a boat with a generous latitude of use potential, it draws design cues from a pretty diverse group of sources and sets a new standard for home built power boats with a decided edge towards fuel economy and responsible boating. 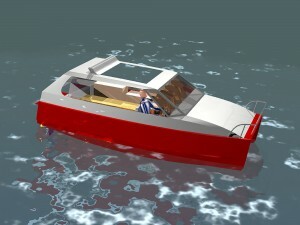 This entry was posted in Catamarans, Engine powered Catamarans, Epoxy and Plywood boats, Multihulls, Plywood Catamarans, Stitch and Glue Boat Designs, Stitch and Glue Boats, Stitch and Glue Catamarans and tagged coastal adventure boats, Outboard Powered Boats, plywood boats, plywood multihulls, Plywood Power Catamarans, Power Catamarans, Sport Utility Catamarans, stitch and glue boats by ChrisOstlind. Bookmark the permalink.